Marcelo helps him get revenge on ringleader Neymar. 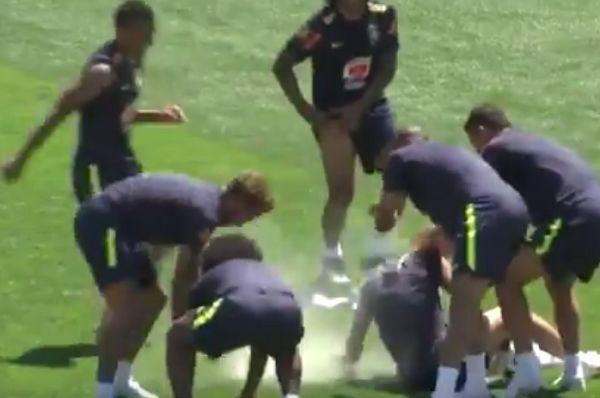 Brazil players marked Philippe Coutinho’s 26th birthday by egging him as well as dousing him with flour and water during a training session. Barcelona star Coutinho was enjoying a nice sit down when Neymar smashed an egg over his head, prompting others to pile in with other cake ingredients. However, Real Madrid defender Marcelo helps Coutinho gain revenge by chasing Neymar and pinning him down so he can also be subjected to an egging. Tite’s Brazilian side get their World Cup finals campaign underway against Switzerland on Sunday evening.